4. Decoration material and Dresses for deities like outfits, golden crowns, garlands as custom made. 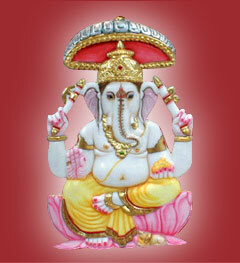 We can carve all these deities as per your specification in different styles and sizes. Lord Ganesha is carved in assorted designs & postures as per ethcics in the different region of India...in white & black marbles. Her statues are available in pure white marble duly carved with decorations and "Aastras" as specified. His deity has to be installed in every temple. He is also carved in other Postures and has ten incarnations. These deities are carved from pure white marble in a variety of sizes duly decorated with pure gold paint on ornaments.